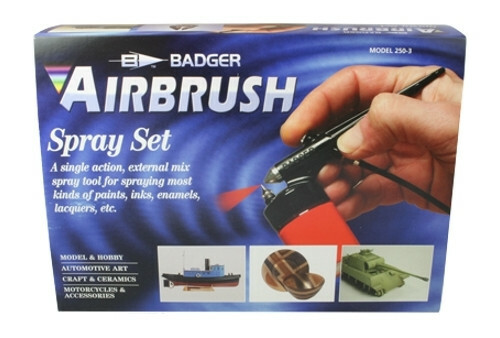 Badger's 250® basic spray tool features simple air and paint controls which allow the spray pattern to be varied. Enamels, artist's colours, lacquers and any liquid that can be thinned down to the consistency of milk can be sprayed through the Badger 250. The 250 is basic enough for children, (ages 8 and up) to use with minimal supervision, yet efficient enough for adult use. Hands-on inspection and testing insure Badger's high quality standards. 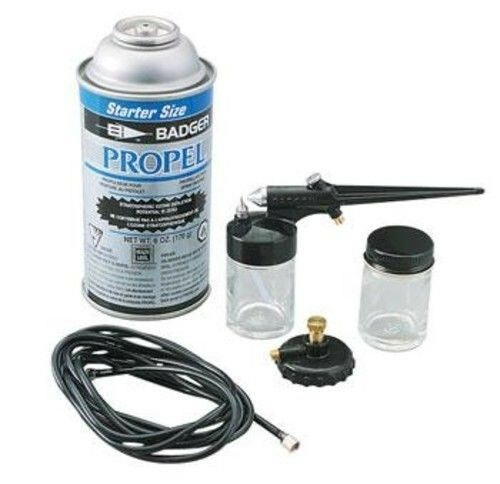 This airbrush is perfect for jobs requiring large overall coverage with medium to heavy viscosity materials. The spray pattern can be adjusted from 3/4" (19mm) to 2" (50.8mm) simply by turning the paint tip. The Badger 250 uses 3/4 oz. (22cc) or 2 oz. (60ml) jars. Operates on 20 to 50 psi (1.4 to 3.5 bar) - if you wish to use a compressor as an air source.